¨ Initiating - where a project starts up, requirements are understood and developed, various possible solutions are identified and considered, and a high level solution is chosen. (Please note that the word Solution is being used in its widest sense, not meaning an IT solution - although a solution may include IT. ¨ Elaborating - where this high level solution is developed into the designs required to “build” the solution. ¨ Constructing - where the designs are used to “build” the solution. ¨ Transitioning - where the solution (comprising changes to Methods, Artefacts, Environment and Culture) is deployed into Operations. ¨ Using (from the Operation Domain) - where the changed environment is utilised. 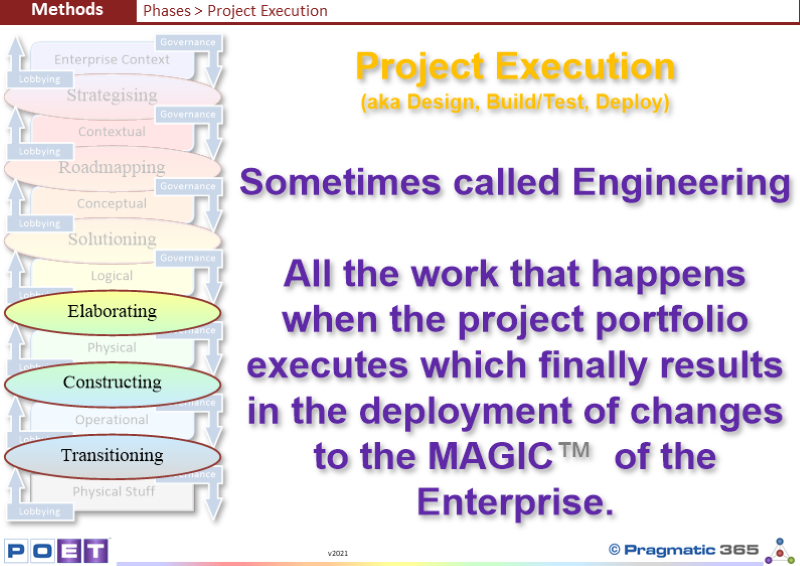 Does your Enterprise recognise Project Execution phases?